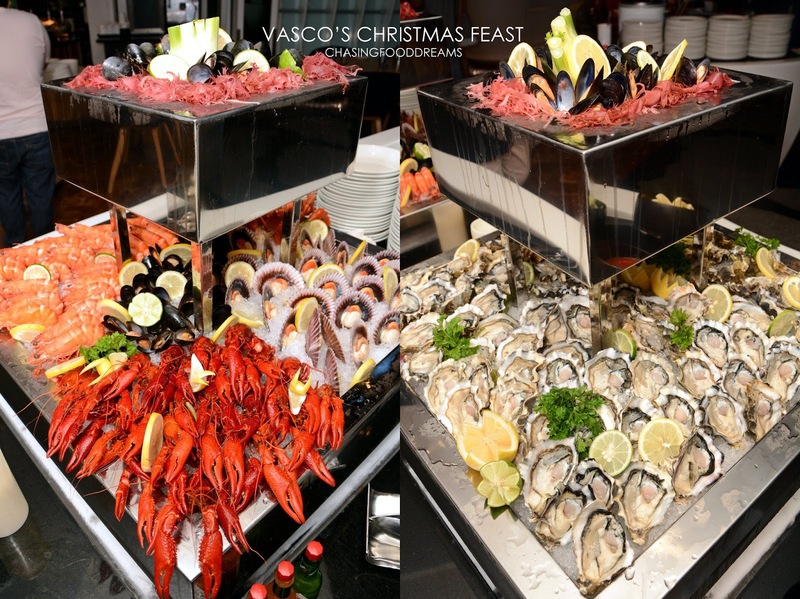 A Feast for the Senses This Christmas and New Year’s Celebration! Tis’ the season to bring together family and friends, the season to gather and feast, the time to create precious memories of ending the year with a big bang! So gather everyone and head on over to the festive celebrations at the Hilton Kuala Lumpur this year end and indulgence in feasts whipped up by the team of award winning chefs and patissiers. Hilton Kuala Lumpur goes French Chic this festive season and the holiday spirit welcomes everyone in every corner of the hotel. 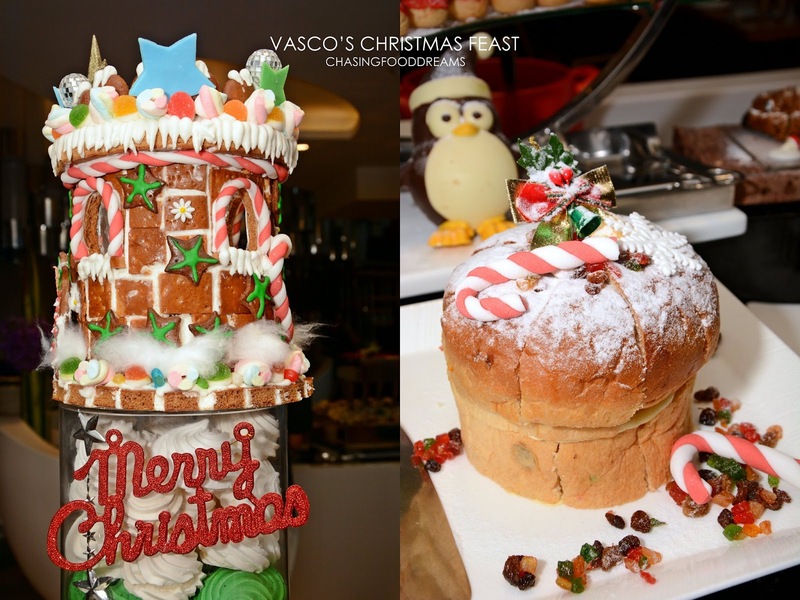 Right at the lobby, the sight and smell of artisan-crafted French and classic Christmas desserts and cookies, the sound of Christmas carols, the touch of the majestic Christmas tree and Gingerbread Houses will capture the many hearts of passersby. Visit Oro Café for Christmas treats for your loved ones The Lounge for tea time treats. 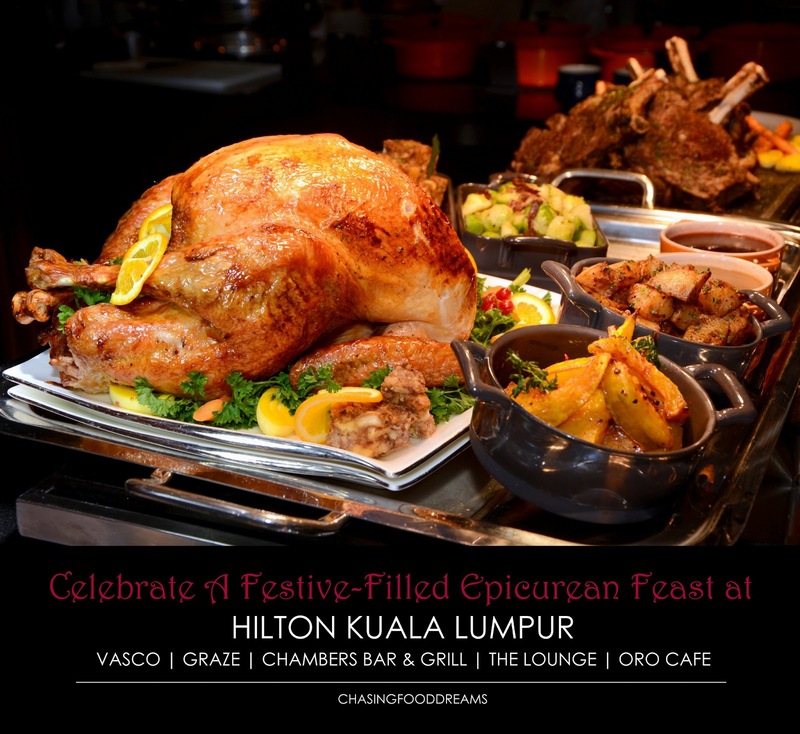 Indulge in the various holiday themed feasts at Hilton Kuala Lumpur at the many gourmet restaurants such as Vasco’s, Chambers Bar & Grill and Graze to be accompanied by handcrafted cocktails, wines and champagnes. It’s the perfect mood to bring in cheer with whether it be a family or friend gathering or a business function. Hilton Kuala Lumpur celebrates these glorious festive offers starting 17 November 2014 till 31 December 2014. Catch a sneak peak at the three main restaurants with their festive menu this season! 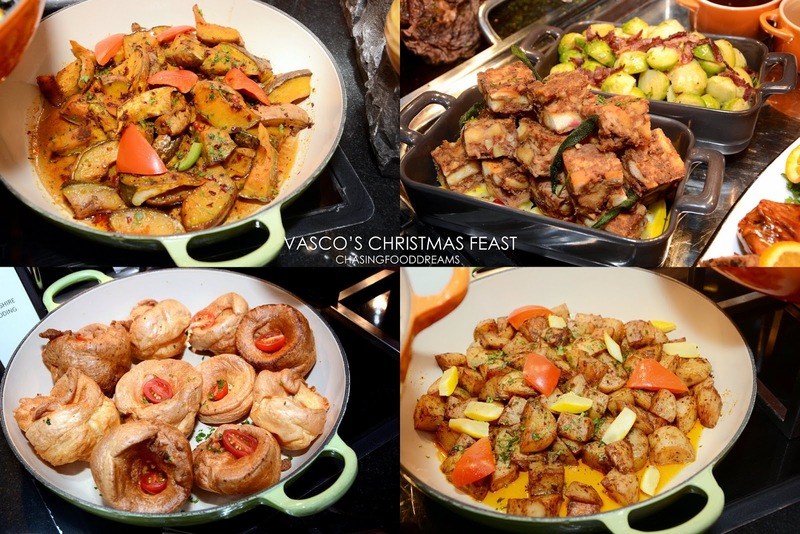 From 1 December till 31 December 2014, Vasco’s is proud to present a magnificent spread of mouthwatering dishes crafted specially for this joyous season. The buffet is a kaleidoscope of luscious festive dishes that includes Honey Glazed Spice Brined Roast Turkey with all the trimmings of Chestnut Stuffing, Honey Roasted Potatoes, Butternut Squash, Brussel Sprout with Beef Bacon, Cranberries and Giblet Gravy. Savor the king of rib, Roasted Prime Rib with Yorkshire Pudding, Gravy and more to get the festive senses going. The turkey was beautifully roasted and succulent while the prime rib is grilled to medium pinkness for tenderness. I was also impressed with the side dishes. Seafood lovers will definitely be pleased with the majestic spread of its Seafood Bar and other Grilled Seafood dishes of Oven Baked Slipper Lobster Spinach with Cheese Mornay and Asian Spice Marinated Black Cod Squid Ink. The seafood bar host Poached Tiger Prawn, Freshly Shucked Pcific Oysters, Pink Scallop in Shell, Crayfish, Poached Black Mussels and Manila Clams. Other stations included Salad Bar, Pizza Station, mouth-watering rotisseries, Western and Asian delicacies. Make sure to save some room for desserts! The Patissiers are extremely busy churning out scrumptious desserts of holiday themed cakes, cookies, bread, desserts and more. 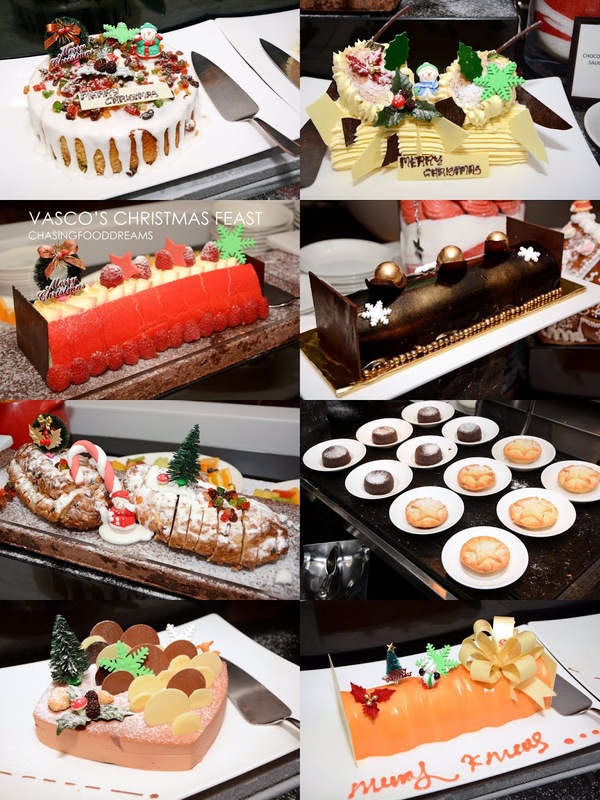 Insanely gorgeous Macarons, Cupcakes, Yule Log, Christmas Fruit Cake, Christmas Stollen, Panettone, Chocolate Fountain and more is the perfect way to end a festive feast! The fine dining establishment is set to impress this festive season with it’s 4-Course Festive Menu with a special Chambers Christmas Cocktail/Mocktail on arrival. We savored Seafood Robotayaki to start the meal featuring Marinated Robatayaki Prawn and Baby Squid served with Horseradish Sauce and Grilled Hokkaido Scallop and Goat Cheese on Shell with Beetroot Puree. The flavours are intense, with power notes of horseradish giving the seafood a kick in flavours and the goat cheese jazzing up the sweet succulent scallop. Main course showcased Grilled Quail with Sauteed Red Cabbage and Raisin served with Marinated Yellow Beetroot and Plum Sauce and Grilled Smoked Turkey Breast with Diced Dried Fruit and Prune Sauce served with Sauteed Brussels Sprout with Beef Bacon. Both turkey and quail are beautifully moist and tender. The turkey went well with the lightly sweetened dried fruit and prunce, which is a lovely change from the usual cranberry. The savory quail had the perfect tangy sautéed red cabbage and sweet raisin to give the tiny bird a unique flavour. Saving the best for last, dessert was Red Wine Poached Pear with Blue Cheese and Gingerbread Ice Cream. It’s an unusual combination but worked wonders on the senses with its strong blue cheese cream contrasting against sweet mellow wine poached pear. My favorite was the Gingerbread Ice Cream! Graze offers a mix selection of classic and contemporary European dishes. 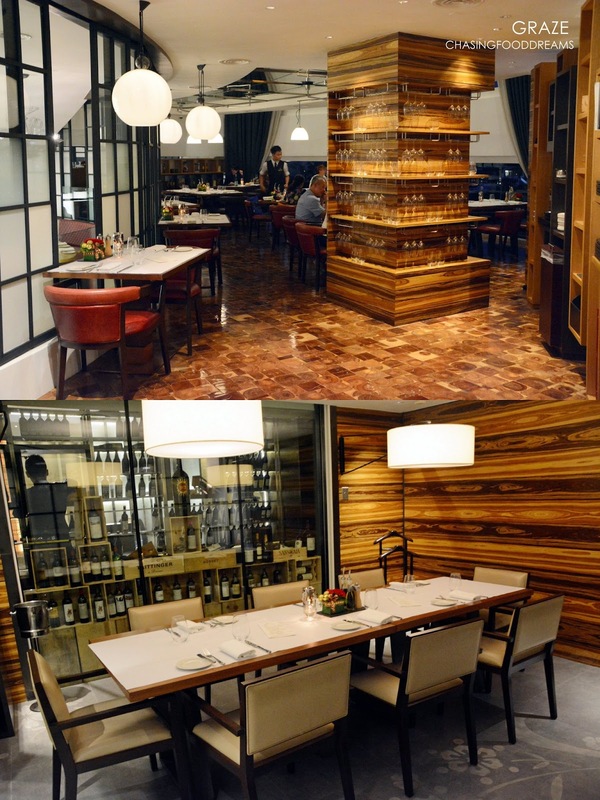 The restaurant is cozy and elegant with a magnificent panoramic view from the window seat. There are several course festive menus available. Our evening festive menu was a 4-Course Menu featuring Caesar Salad, Carrot & Ginger Soup, Steamed Salmon or Duo of Lamb and Raspberry Cheese Cake. Taking on the new age science, our Caesar Salad comes with a 62 degree poached egg with a gorgeous molten egg yolk center. Coupled with the classic romaine lettuce, crispy toasted garlic brioche croutons, lightly tempura battered bacon, parmesan shavings and Caesar dressing, the salad is a force to be reckon with in flavours! I really enjoyed the Carrot & Ginger Soup with Scallop and Chestnut Quenelles. The bisque has a tingling soft gingery sweet note and the quenelle added more texture and flavours to it. It’s a heart-warming dish. Steamed Salmon features a roulade of salmon stuffed with spinach mousse, neatly coiled and steamed, and served on a bed of crab tomato and lime beurre blanc sauce. The dish is more delicate in taste and has a lovely citrus note with a buttery sauce. At sight, the Duo of Lamb is artistically presented like a work of art. The dish has marinated lamb rack nicely chargrilled and roasted lamb loin served with celeriac puree, garden vegetable and garlic jus. Both lamb is cooked to perfection and the garlic jus is simply divine. The course menu ends with Raspberry Cheese Cake with a delicious crispy Almond Tuile and Vanilla Ice Cream.